This small fish is smoother than some of its seahorse counterparts, but still displays a variety of colors and the ability to change color quickly for camouflage. It is a poor swimmer that prefers to ambush small prey from its secure hiding spot among seagrass, mangroves, or gorgonian coral, quickly sucking them into its toothless snout. They mate for life, have complicated courtship and bonding rituals, and the male carries the embryos to term in his brood pouch. These longsnout seahorses grow to almost 7 inches long and live one to four years. They have few predators because of their camouflage and bony-plated body, but are collected by humans for the aquarium trade or folk medicine. English language common names for this species include longsnout seahorse, Brazilian seahorse, seahorse, and slender sea horse. 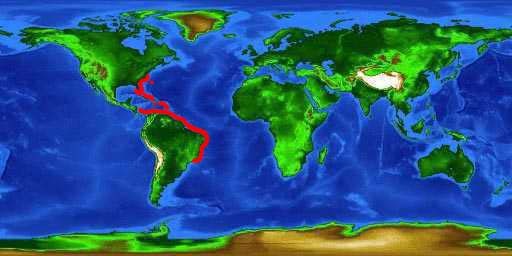 Other common names include caballito narizón (Spanish), caballito hocico largo (Spanish), caballito de mar (Spanish), caballito (Spanish), cavalo-marinho (Portuguese), kaba ‘i awa (Papiamento), langsnudet søhest (Danish), and nagabana-tatsu (Japanese). The longsnout seahorse is considered an important species in the aquarium trade and is one of the most exported Brazilian marine ornamental fish species. In addition, it is commonly collected for use in folk medicine, as souvenirs, and for religious purposes. This seahorse is also frequently taken as bycatch in non-selective fishing gear such as trawl nets. 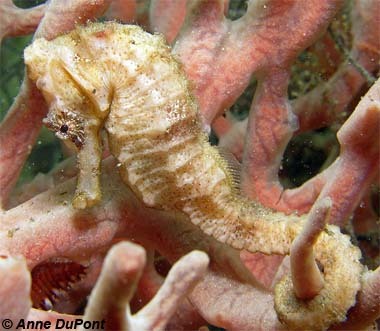 Many seahorse populations are declining due to unsustainable exploitation of these unusual fish. They are collected as aquarium fish, folk medicine, curiosities and for religious purposes. Seahorses are also taken as bycatch in the shrimp trawl fisheries off the coasts of the US, Mexico, and Central America. 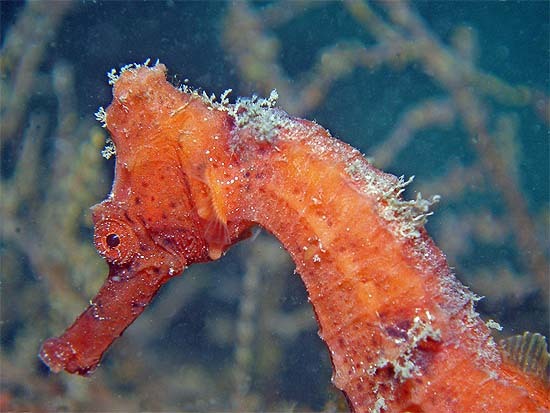 In particular, the longsnout seahorse is considered threatened in the US by the American Fisheries Society due to the rarity of this species along with degradation of its seagrass habitats in South Florida. However, according to the World Conservation Union (IUCN) the longsnout seahorse is considered “data deficient” and not listed on the IUCN Red List. This high exploitation of the longsnout seahorse along with the ever-growing threat of inshore habitat degradation, has resulted in the listing of this species as “threatened” in Appendix II of CITES 2004. > Check the status of the longnose seahorse at the IUCN website. This seahorse can be found throughout the Caribbean Sea and the western North Atlantic Ocean including off North Carolina and the southern U.S. as well as Bermuda, and south to Santa Catarina, Brazil. Typically the longsnout seahorse is considered an uncommon species although in some locations it may be common. It is usually observed attached to mangroves, seagrasses or gorgonians, however it may also be seen swimming freely in the midwater or associated with floating sargassum. During the night, this species stops feeding and also stops swimming, wrapping its tail around a holdfast and remaining there until dawn. Seahorses swim by rapid undulations of the dorsal and pectoral fins. The depth range of this seahorse is 0-55 meters with smaller individuals residing in shallower habitats. Male longsnout seahorses typically have a smaller home range than do the females, this is thought to be due at least in part to lower mobility due to the brood pouch. 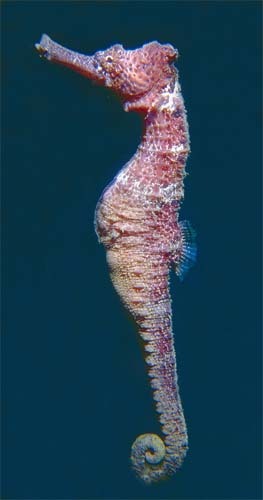 This seahorse has a narrow body with a long thick snout. The coronet (crown-shaped piece of skin located at the top of the head) may be quite large, rounded and convoluted. Tubercles are low and rounded while spines are absent with the exception of eye spines. Typically there are no skin appendages, although the longsnout seahorse is covered with rings of bony plates. The tail is long and curved. The longsnout seahorse ranges from black to yellow, red, orange and brown with numerous white dots primarily on the tail. Pale saddles may be present along the dorsolateral surfaces. A interesting aspect of seahorse coloration is the ability to rapidly transform color patterns to blend with their immediate surroundings. This species is similar to the lined seahorse (H. erectus) which has a similar body type however it typically has pearly white lines and spots along the body and face. It also has a deeper body and a wedge-like or triangular coronet with sharp edges and spines while the longsnout seahorse has a narrower body and a rounded coronet. Seahorses lack teeth however they do have a long snout to accommodate their diet of small shrimp, very small fish, plants, and plankton which they swallow whole (see “Food Habits” section for more details). Seahorses generally live from one to four years. The maximum reported size of the longsnout seahorse is 6.9 inches (17.5 cm) in height (top of the coronet to the end of the stretched out tail). This species reaches maturity at approximately 3.1 inches (8 cm) in size. The diet of the longsnout seahorse consists of ghost shrimp, grass shrimp, opossum shrimp, amphipods, and other small marine crustaceans. Seahorses are know as “ambush” predators, often sitting and waiting for prey items rather than actively pursuing prey. When feeding, seahorses use their long snout and small mouth to create pipette-like suction drawing live prey into their mouths. Longsnout seahorses search for prey only during day light hours. They do not have teeth, food is swallowed whole, passing quickly through the digestive system. The ovoviviparous longsnout seahorse is pair-bonded in the wild, in other words, males mate for life with the same female. Breeding season extends for at least eight months out of the year with some reports documenting this species as actively reproducing year-round with a peak from October to February. Courtship behavior includes the male impressing the female with dramatic changes in coloration, pouch displays, and graceful swimming behaviors. The female will deposit up to 1,600 eggs in the males pouch where fertilization takes place. Seahorse eggs are oval or pear-shaped, orange in color, and measure 0.05 inches (1.2 mm) in diameter. The pouch seals shut during egg development, opening approximately 14 days later when the eggs hatch and the male gives birth to tiny young seahorses that appear identical to mature seahorses. Newborn seahorses measure approximately 0.2 inches (5.14 mm) in height. External parasites of seahorses include flukes, isopods, and monogenetic trematodes; internal parasites are digenetic trematodes, cestodes, and nematodes. The longsnout seahorse was originally described by Ginsburg as Hippocampus reidi in 1933. Synonyms found in scientific literature referring to this species include H. obtusus (Ginsburg 1933) and H. poeyi (Howell Riviero 1934). This fish belongs to the family Syngnathidae which includes pipefish and leafy sea dragons. The etymology of this family name is from the Greek syn meaning “with” and “together” along with gnathos translated as “jaw”. The genus name Hippocampusis derived from ancient Greek, translated as “horse/sea monster”.